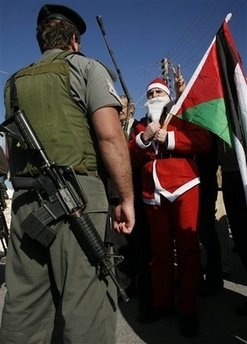 Even though he is very busy this time of year giving gifts to children all around the world; this Christmas season Santa Claus took some time of and came on an early visit to Palestine. He did not come with gifts but came to stand in solidarity and bring hope to Palestinians suffering from the continued occupation of their land. He came to bring hope to the people of Bethlehem where on a daily basis farmers and villagers are having their land stolen for the building of the Separation Wall and the expanding of illegal settlements. On the 21st of December Santa joined the weekly nonviolent protest. This protest takes place in the Southern villages of Bethlehem every Friday and it includes Palestinians, internationals and Israeli nonviolent activists working together to oppose the military occupation. 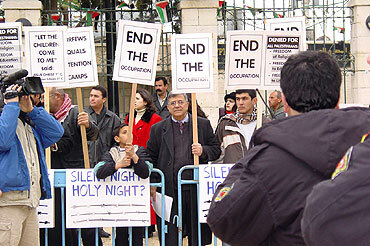 Every Friday, the nonviolent protest is faced with tens (sometimes hundreds) of heavily armed Israeli soldiers. This Christmas Friday was not any different and even Santa was not surprised.